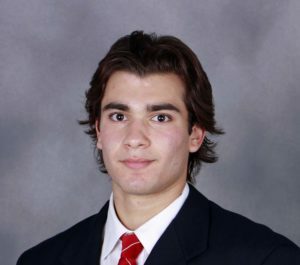 The Wisconsin Badger men’s hockey team wrapped up the regular season on Saturday with a 3-1 loss to the Ohio State Buckeyes at the Kohl Center. The Badgers (19-4-1, 12-8-0-0 Big Ten) fell behind 2 minutes and 46 seconds into the first period when Ohio State’s Mason Jobst scored on the power play. The Buckeyes (20-10-6, 11-8-1-1) never trailed, adding two more goals in the second period. The Badgers only goal came from captain Luke Kunin on the power play in the third period. Wisconsin seniors Grant Besse, Corbin McGuire, Jedd Soleway and Aidan Cavallini played their final home games. The sweep cost the Badgers a chance to secure an at-large bid to the NCAA Tournament. They did still finish second place in the Big Ten Conference, which gives them a first round bye in the conference tournament in Detroit this week. But the Badgers will have to win the tournament to gain a bid to the NCAA Tournament.